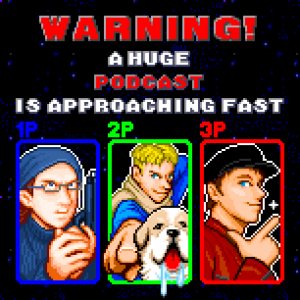 Warning a Huge Podcast reaches the big ONE ZERO. If you’re interested in current Japanese games, and up to the minute commentary on the industry in Japan, it’s the only podcast worth listening to (probably). It clocks in at close to 4 hours, which I like, since the commentary is interesting and it allows me to get on with mindless household chores and driving, over a series of days. * Details on massive selling of Square-Enic stock by a single person (1% of all company stock, worth $24 million) - possibly a disgruntled fan? * Brief touch on doujin games, with an interesting idea for a creation model combining the superior production values of Japanese doujin with the more ambitious and experimental mechanics and level design of western indies. * Hilarious stealth action story at the end, pertaining to life at the old GameFAN magazine, which is well worth waiting for. Or at least I found it amusing – anything which documents office life on games magazines always piques my interest. Coming Next, Comment of You, and Casey joins Twitter! Episode 10 is actually really good, one of my favorites. Looking forward to the next one. I rather enjoy 8-4 Play, which was linked to in the last blog post about WAHP, too. I might turn these into general podcast entries, but I don't have much time to listen to more than one every few weeks. I only recently listened to 8-4's TGS podcast (which was great). No really, I wish there were more podcasts about japanese games.